and wanted to be a Teacher in a future, And it was fulfilled! 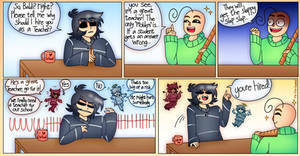 I bet baldi's gonna have a BAD TIME! I have a weird head cannon that Baldi was actually sent to jail once when he was younger for vandalizing the sky with math equations. Nobody know's how he vandalized the sky, they just know he somehow did. That means that any, ANY hit will result in him dying. "when you see your own fandom" ---- Cuphead's face in the final panel. I absolutely love this portrayal of him losing his hair above probably all others I've seen! It just fits! I absolutely love your style too, keep up the amazing work~!! But 2 +2 = 6 you know the father the mother and the child resulting in it. anyone notice in the sec part, his hair was shedded. So Baldi smacks people because their failures insult his accomplishments? Did anyone noticed a kid was playing on a ds in the corner of the 1st panel? THIS IS ADORABLE AS HECK! I LOVE IT! Heh good ol Sans always making the jokes.